Greetings, judges! This week’s rock star has done everything from feeding his local community information through a newsletter to arranging them to be fed at judge get-togethers. Say hello to Jonas Drieghe! Jonas, you’ve been praised for having a big impact on the BeNeLux community even when you were a L1. What sorts of ways did you step up? I quickly realized that the best way to help out in our region was through communication and collaboration. I attended 1 or 2 regional judge dinners and started helping out organizing them on a regular basis. I got involved in couple of other projects too (like Annotated MTR and Benelux Bulletin, our regional newsletter). I got introduced to it by some older friends around the release of Onslaught and instantly fell in love. I’m often away for one or more days during weekends, so it has definitely had an impact on planning. Besides that, I believe part of the mindset of continuous self-improvement and looking for opportunities to help out translates well to both personal and professional non-Magic life. The program itself and the self-improvement based mindset of our community makes every effort a breeze and every event a well-spent day. Judging is more that just rules and policies and I believe that the challenges in various other areas (community building, customer service, logistics etc.) are both interesting and motivating. Always stay curious. Look at what other judges are doing because there is always something to learn, just like other judges always have something to learn from you. Definitely the TO. Around the time I started judging, he became the new owner of my LGS and he immediately understood the importance of a great (playing and judging) community. His generosity towards players and judges in combination with his can-do attitude and everlasting smile make him very rewarding to work with. I love every single one of our judge dinners. We used to go to the same restaurant in Brussels every time, Ninja House, an all-you-can-eat Japanese restaurant. But we are trying something different at the moment. Every Wednesday before a pre-release weekend, we host a judge event in one of Belgium’s stores, where we discuss various topics while enjoying food and drinks. Afterwards, we often play some games. The idea behind this change is that newer judges are more willing to attend in a local game store than in a restaurant and that it’s a great way for judges and TOs throughout the country to get to know each other. I play mostly mono-white in Modern and Legacy and I have found myself with two Thalia, Guardian of Thraben on board way more than I would like. Stupid yet honest mistake but it seems to always creep up on me when I’m getting tired. 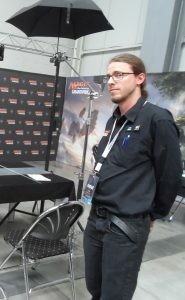 I was working the early Deck Checks team at GP Utrecht (Modern Masters 2), my first GP. 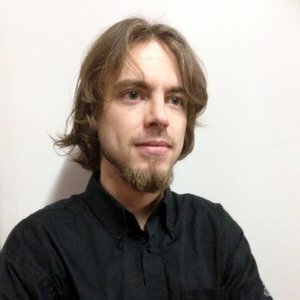 While the event had thousands of deck lists, we got the added challenge of having to process hundreds of players dropping (because of the value of their sealed pool) before round 1 could start. We managed, albeit barely, to get it done by being super methodical, continuously improving our process and working as a well-oiled machine. I’m still very grateful I had both Jack Doyle and Charlotte Sable by my side at that event, as they were instrumental in keeping everything calm and organised. 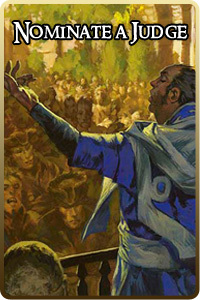 Leonardo da Vinci. He’s the archetypical Homo Universalis, so I believe he would have a lot of interesting things to talk about. Also, I’m very curious how people like him (and the likes of Einstein etc) would thrive in our modern, computer-driven world. I would probably be more involved in the Open Source software community, speaking at meetups and conferences. Watching players enjoy themselves is already very rewarding. When there are other judges around, I love to challenge (and be challenged by) them with interesting questions or scenarios. Probably Goblin Artificer because my tinkering with everything is often based more on gut feeling than on deep thought. 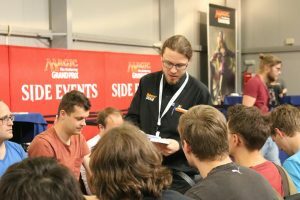 At GP Copenhagen, I was working side events and could see a bunch of issues with main event floor coverage because of my location in the venue. I made sure my event was being watched and got the problem sorted out by rearranging some stuff and talking to some team leads. 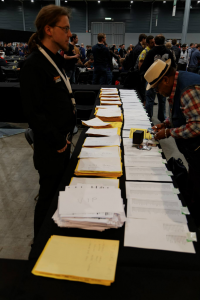 After the round, the main event head judge (Kim Warren ) showed up near the side event stage looking for me just to figure out who was doing such a wonderful job at side events. As I didn’t have a lot of GP experience yet, I felt really proud in that moment and learned how valuable public praise is to keep people motivated and productive. Finding the strengths in other people and challenging them whenever I can. It also helps to understand 5 languages. Short-term goals are simply to keep empowering our region with fresh ideas and focus more on reviews. The long-term goals are currently rather cloudy as I’m pretty busy with raising children and renovating our house, but for now it’s just to keep judging while trying to improve myself and the people around me. Criticise privately, praise publicly and sit down as much as possible when judging. I was put in charge of Public Events on my 2nd GP. I’m a sucker for 80s hair metal. I have 3 perfect games of bowling to my name (so far…). Evan has not delivered a baby in a taxi.